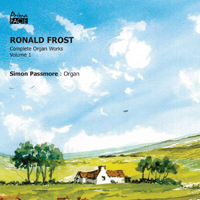 Prima Facie are delighted to celebrate the life and works of the legendary musical polymath Ronald Frost with this first volume in the series of his complete organ works, performed by Simon Passmore. As organist of the historic St Ann's, Manchester, for 37 years, Ronald Frost remained at the forefront of the city's music-making throughout the second half of the 20th century. He was associated with the Royal Northern College of Music (RNCM) where his input and experience helped mould the creative personalities of many of Britain's most eminent practitioners. Likewise, as one of the defining choral conductors of his generation, he brought the Hallé Choir to a level of performance which had few, if any, equals. Simon Passmore was born in Hexham in 1990 and began piano lessons at the age of seven, studying with Hexham Abbey's then directors of music John Green and Michael Haynes, and then with Newcastle University's head of keyboard David Murray. He has given solo piano recitals at numerous festivals across the UK and has featured as a concerto soloist both in the UK and abroad. Simon is currently the Organist and Director of Music at St Ann's Church, Manchester, where he gives lunchtime organ recitals on a weekly basis.